What makes Saratoga Springs NY so special? It’s no surprise that Saratoga Springs NY has received the award for “Great American Main Street”. Our downtown area is a safe pedestrian environment with many eye-catching sites to keep you and your guests busy all day! There are Saratoga events for everyone – including, of course, America’s oldest and most popular thoroughbred racecourse. The racetrack season is in the summer, attracting thousands of people to this historic event! Discover the Saratoga attractions and entertainment that make this region so popular – if you’re an outdoor adventurer, nearby Saratoga Lake offers a variety of activities. Saratoga is a bustling city with a steady stream of visitors and locals driving downtown to experience the best dining, shopping, and events. Thankfully, parking is conveniently located throughout downtown Saratoga. In town, you will find the parking garages, parking lots and street parking options! View the parking map. Anything special we should see?! Saratoga Springs is nationally recognized as one of America’s great destination locations, with attractions including naturally carbonated mineral spas, harness racing and polo, 15 golf courses around the county, and 10 historic museums. Dine at one of the 102 restaurants or shop ’til you drop at the many downtown boutiques. Visit the Beekman Street Arts District in downtown Saratoga, recognized for the mix of art galleries and local artists, unique boutiques, restaurants and much more! What is the closest airport to Saratoga Springs? Saratoga Airport is the closest to almost any event venue in Saratoga, a public-use airport located just three miles southwest of Saratoga. The Albany International Airport is 30 minutes South of Saratoga Springs. Commercial airline services are Air Canada, American Eagle, Continental, Continental Connection, Delta, Delta Connection, Northwest, Southwest, United/United Express, USAirways/USAirways Express. Albany International Airport is the major air center for the Capital Region, Northeastern New York and Western New England. Albany Airport has 75 arrivals and 75 departures daily from most major cities. Is Bus transportation available to Saratoga? Adirondack Pine Hill New York Trailways have regularly scheduled bus service throughout New York State and to the Canadian cities of Montreal and Toronto. Capital District Transportation Authority (CDTA) offers direct or connecting services to Saratoga Springs, Albany, Lake George, Glens Falls, Montreal, Boston and more. CDTA has become the premier mobility provider in the Capital Region. Upstate Tours serves Saratoga Springs, the Capital District, and beyond. Amtrak has two stations in New York’s Capital District – Albany/Rensselaer (45 minute ride by cab or shuttle, group cab fare available) and Saratoga Springs (less than two miles from your headquarters hotel, cabs meet both daily trains, hotels have shuttle vans or cars if you call ahead). The Saratoga address is 26 Station Lane, Saratoga Springs, NY 12866. When is the 2017 Saratoga Racing Season? What are the 2017 Dates for Saratoga Performing Arts Center (SPAC)? The SPAC 2017 Season runs from early June-September. The New York City Ballet (July 5-15), Che Malambo (July 20) and The Philadelphia Orchestra (August 2-19) make their summer home here in an acoustically ideal, multi-tier, open air amphitheater in the heart of Spa State Park. The summer season features SPAC Rock and Run 5K, 10K, and half marathon (May 21), Freihofer’s Jazz Festival (June 24 & 25), Opera Saratoga (July 1-16), The Chamber Music Society of Lincoln Center (August 6-22), Live Nation rock and pop music concerts, Pre-Performance Talks, and the Saratoga Wine & Food Festival (September 8-10). What are the 2017 Saratoga Polo Dates? Many businesses and restaurants in Saratoga Springs have this cute little decal near their entrance. When you see it, you know that you and your well-behaved dog are welcome inside. 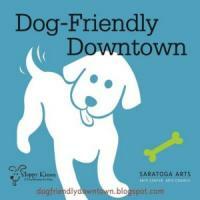 View the map for dog friendly places. What’s the weather like in Saratoga Springs? Beautiful! With four distinct and captivating seasons, visitors enjoy the very best that each as to offer! From the warmth and sunshine of summer, through the comfortable autumn weather and stunning colors, into winter where a gorgeous blanket of snow is not only beautiful, but fun for winter enthusiasts! Springtime in Saratoga offers gorgeous weather, beautifully green countryside and colorful flowers blooming everywhere. There are more restaurants in Saratoga Springs per capita than any place in the United States! Coffee houses, French bistros, Jazz clubs, classic American cuisine, Italian, Mexican, Indian, sports bars, seafood and steakhouses are just a sampling of over one hundred popular restaurants and night spots in the Saratoga area. You’ll find a wide range of Saratoga hotel properties to accommodate your style and budget. From Bed & Breakfasts and Inns, Hotel and Motels, to Campgrounds and Rentals, the city of Saratoga Springs has over 40 lodging properties, not including nearby cities such as Ballston Spa, Malta, Glens Falls and more. In Saratoga City limits, there are over 1,900 hotel rooms, and over 3,500 hotel rooms including Saratoga and surrounding areas such as Clifton Park, South Glens Falls, Malta, etc. In addition to the incredibly historic sites and activities in and around Saratoga Springs, there are plenty of places for good old-fashioned fun! Great Escape – Six Flags park in nearby Lake George offers every theme park ride, treat, and entertainment imaginable!